Dogs, like us, are one of the only mammals that play well into adulthood. And while we may not think much of it the truth is dogs thrive on interactive play. Play is a great stress reliever, it’s a hell of a workout, and it helps creates a strong bond between you and your dog. And to top it off dogs that engage in a lot of interactive play are less likely to exhibit destructive behaviors such as excessive chewing and barking. Play doesn’t always have to be about just having fun either (though there’s certainly nothing wrong with that). 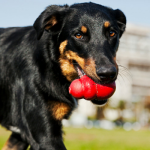 Play can be used to reinforce good behavior in our dogs. For years I stuck to just using treats for training — but one day I tried using a game of tug as a reward instead. And holy cow was I surprised by how well it worked. Turns out my dog would much rather work for a quick game of tug than a little piece of cheese. I lucked out with Laika — she had a strong play drive to begin with. 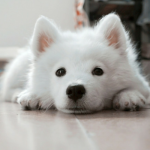 If your dog isn’t so playful there are some things you can do to increase their desire to play. 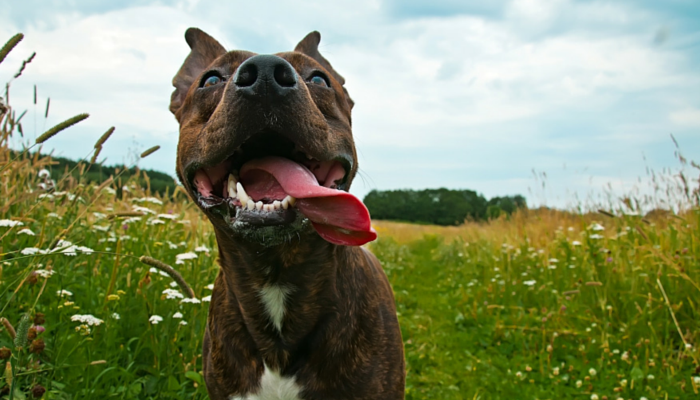 Here’s 3 tips to increase your dog’s play drive. Although I’d like to take credit for discovering the fact that play works well as a motivator for dogs I’ve gotta be honest — the pros have been using it for ages. If you’ve seen police K9s or bomb detection dogs in training I’m sure you’ve notice that their reward is often a tennis ball or fetch toy. They use play because it’s an extremely motivating reward. These dogs are naturally driven and their trainers use that drive to their advantage when it comes to teaching their dogs new stuff. But play as a reward doesn’t need to be limited to high drive dogs. Most of our dogs love to play — but sometimes it’s all about figuring out what sort of play motivates your dog in particular. Does your dog seem naturally playful? If not you’re not alone. Like us, our dogs all have their own personalities, and some are more playful than others. 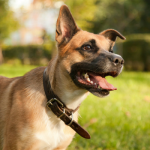 A lack of play in your dog could also be due to their past experiences (or lack thereof). Some dogs don’t know how to engage in play. Some dogs have never lived in a home environment, some lack proper social interaction cues, and some just have no clue what toys are. When teaching your dog to play start with a toy that can easily be tossed around like a tennis ball, tug toy, stuffed animal or braided rope toy. Since your dog doesn’t know how to play you’re going to be the one teaching him, and you’re going to be doing it by showing him how it’s done. Start tossing the toy around and chasing it. Act excited about chasing it, and don’t be afraid to get goofy. 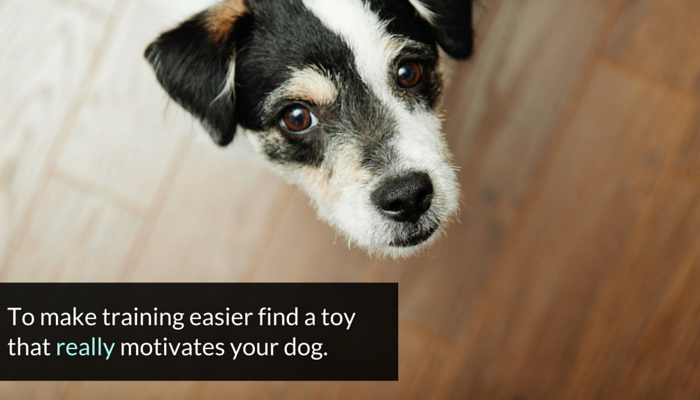 Your goal is to play with that toy so enthusiastically that your dog will be encouraged to start getting in on the action as well. Toss it a few feet, chase after it, and encourage your dog any time they start to join in and go after it as well. Use your happy & excited voice to get him even more hyped up when he joins in on the fun. Praise your dog every time they put that toy in their mouth. Make it known that chasing after toys & picking them up is exactly what you want them to be doing. Boost their confidence by praising all those silly play moves. Once your dog starts to enjoy engaging in interactive play with you you’ll notice something awesome happens – your bond gets really strong. And every time you play it gets even stronger. By using something fun like play when it comes to training you can help make new training experiences less stressful for the both of you. Most toys that are used as training rewards are either fetch or tug based. When it comes to learning hard tricks or something brand new you’re going to want to stick with something really motivating aka their favorite toy. After playing around with enough toys you’ll get a good gauge on what your dog finds most exciting, and what toys are just blah. 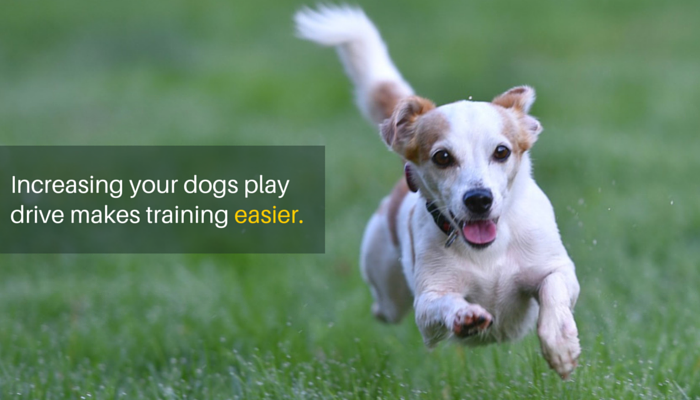 The trick is to find out what really motivates your dog when it comes to play. Is it their favorite ball, tug toy or a game of fetch? Use those highly rewarding toys when you’re training something new, and when you’re just brushing up on old tricks you can use something a little less motivating. I was surprised by how motivated (and easy to distract) Laika is when a tug toy is involved. I bring one along on walks to help keep her focused when we’re faced with something challenging. Since she can be reactive to other dogs that’s when I get that tug toy out – the moment I notice a dog in the distance, long before she’s face to face with a new dog. If we start playing tug before that strange dog is close it works. She’s so focused on that tug toy she pretty much ignores what’s going on around her. That tug toy is her favorite, it’s the toy that gets her more hyped up than all others – and that’s what you’re trying to identify for your dog. Find that special toy that really gets your dog excited, it makes training in difficult situation much easier. 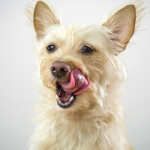 Is your dog motivated by food more than toys? If so try making one of their toys smell like their favorite food or use a simple treat dispensing toy. Try using a few different toys with your dog to see which ones he enjoys most. What I love about dog training is the ability to switch up the rewards to keep it interesting for the both of us. Since Laika was naturally pretty playful and highly driven I stick to boring old food rewards for basic obedience, and reach for the mega awesome tug toys when working on something difficult or new. Just like us our dogs get bored with their toys, and the easiest solution I’ve found is to use a rotating system. Rather than giving your dog access to all of their toys all the time select a few different ones each week, while the rest remain on the shelf. After a few weeks apart from a specific toy your dog will be pretty excited to see it again. And when it comes to those mega toys – the ones that really get your dog excited – I’d restrict access to those until you’re ready to play. You can keep those highly motivating toys special by only using them when you’re engaging in interactive play. Your dog will know that when you bring that special toy down from the shelf it’s go time. They’ll be motivated to play along whether it’s for a quick game of tug, fetch or learning some new tricks. Don’t be afraid to experiment. Use food as a reward one day, fetch the next, and then tug on the third day. 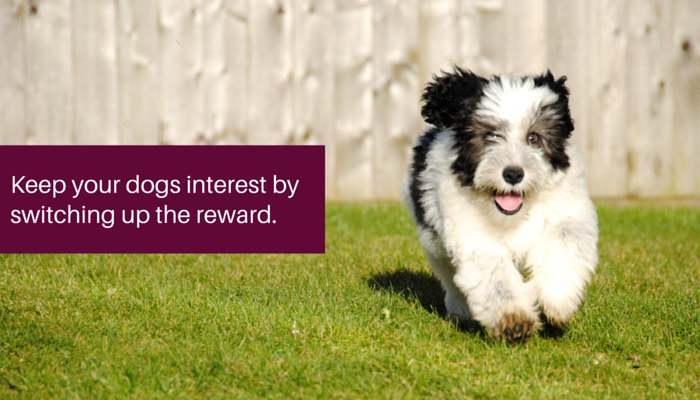 By switching up the rewards you’re holding your dogs interest, and that makes training much easier. I like to think of it as how we humans get paid at work – we do it for a paycheck but some extra praise on a job well done or a bonus from time to time are awesome, and those are what can help keep us motivated. Your dog might be used to doing tricks for kibble, but giving them some extra praise and bonuses from time to time can increase their motivation. 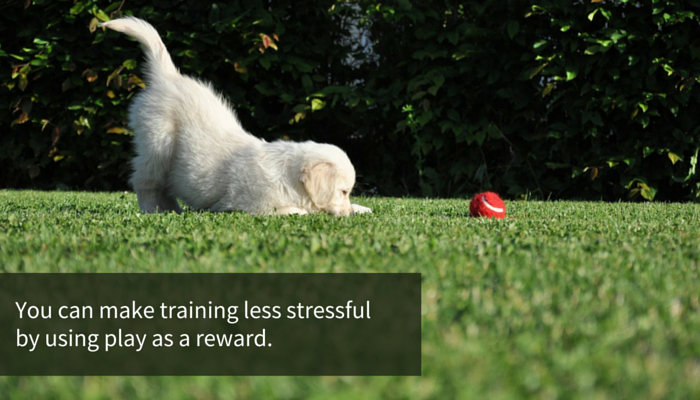 Don’t let training get boring by letting your dogs rewards go stale. Keep them interested by switching things up. When you use play as your reward it’s more enjoyable for both of you, and fun can be the best motivator of all. Don’t bore your dog with the same old reward all the time. Keep their interest by switching things up. How Would You Rate Your Dogs Play Drive? Does your dog have a naturally high play drive? Do you use that play drive when it comes to training? Have you ever had to increase your dog’s play drive? Looking for some fun things to do with your dog? 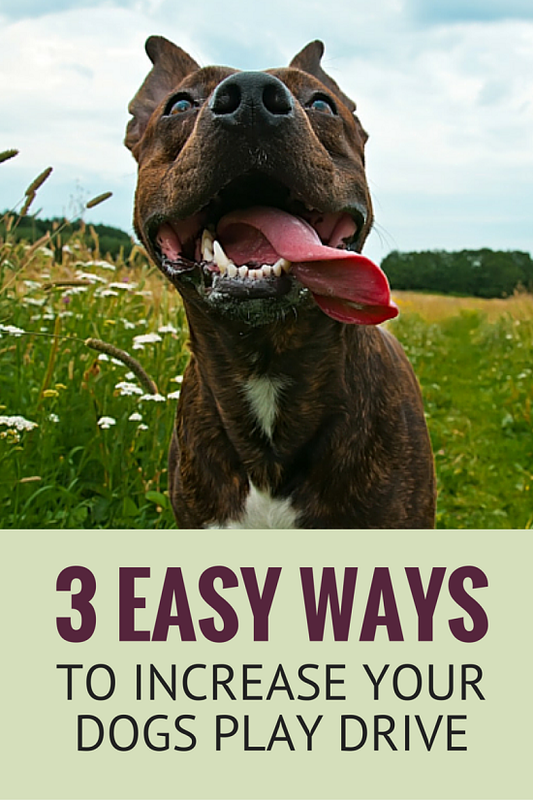 Check out 33 simple indoor games for dogs & 26 quick ways to relieve dog boredom. This is such a great post and a great reminder for me to clean up our toy collection! This weekend, I’ll be going to the dog toy bin to buy a bunch of new toys. The toy boxes are looking a little ratty and boring – the dogs rarely dig through them. It’s time to clean out the boxes. I can’t wait to see how happy and surprised everyone looks. I’m going to make sure I do all of this stuff so that my pupper doesn’t lose all her energy when she gets older!